There have been a few cooler days recently in Michigan and since coming back from Orlando and my daughter’s wedding, I’ve been craving soup. Something warm and satisfying and comforting like this bowl of New England Clam Chowder. My daughter got married last week in Orlando (we love her new husband) and I’m feeling a little bit tired after all the Pomme and Circumstance. More about the wedding in an upcoming post but just look at how wonderfully this soup looks, and it was equally delicious! 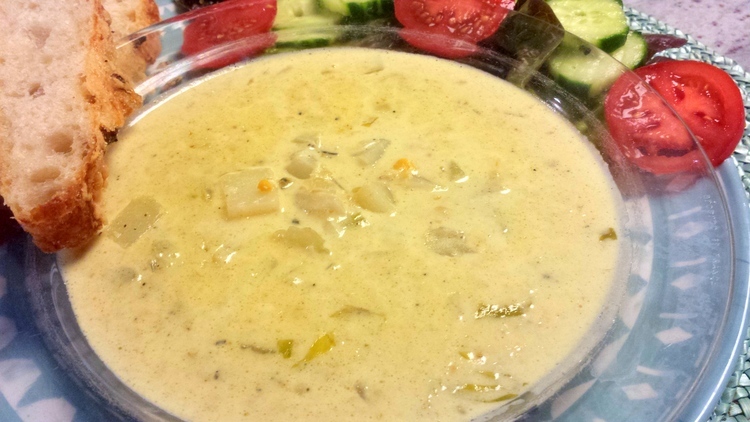 Clam Chowder is one of those classic recipes and there are many variations on the internet but I adapted several to come up with this one. Seafood Chowders were one of the first foods in the US and originated in Plymouth Massachusetts, But rumor has it that chowders originated in France and the recipes were brought over to New England. There are several versions of clam chowders, New England Clam Chowder, Manhattan Clam Chowder and Rhode Island Clam Chowder. The New England Clam Chowder is made with cream. To make a great New England Clam Chowder, don’t try to go healthy and reduce the cream, use real cream. What makes a New England Clam Chowder creamy is not only the cream but the potatoes. I used Idaho potatoes. In addition to potatoes and cream, you can use either chicken broth or vegetable broth. I used the chicken broth. If I was making it for my daughter, who is vegetarian then I would have used the vegetable broth and I think it would have been equally delicious! Additional flavor comes from the onions, celery, and a little butter. The roux gives additional flavor. Of course the main ingredient is the clams. I used canned clams but would like to try this dish with fresh clams. There are a lot of clams in a 10 oz. can of clams so if you use fresh clams it will take a lot of clams. I put these in the food processor and chopped them but I would suggest to take one half of the clams and chop them slightly and the other half to chop more finely. That way you will get some larger pieces of clams in your mouth and you will know that you are eating a clam soup. 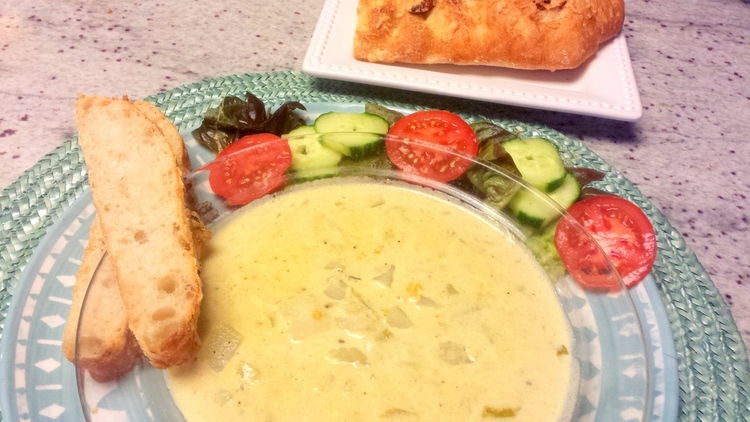 New England Clam Chowder can be served in a small bowl as a side to a sandwich or a starter for a more substantial meal but it works well as a main course with crusty bread and a small salad. What is the difference between New England Clam Chowder and Manhattan Clam Chowder and Rhode Island Clam Chowder? The main difference is that New England Clam Chowder is made with cream and Manhattan Clam Chowder is made with chopped tomatoes and Rhode Island Clam Chowder is made with clam broth. Drain the clams, saving the juice. Chop 1/2 of the clams finely and the other 1/2 clams coarsely and set aside. In a large pot, saute the celery and onions in the butter for a few minutes until slightly soft, do not brown. Add the flour to the celery, onions and butter and stir to make a roux. Add the chicken or vegetable broth to the roux and stir until all the flour is dissolved. Then add the clam juice, cream, bay leaves and potatoes and cook on medium heat until soft. When potatoes are done add the chopped clams and cook for 5 minutes.